TOLEDO, Ohio -- Jon Stanbrough may have had the best seat in the house Saturday, but Ken Schrader probably got the best view. Stanbrough put on a show on the final night of the “Rumble in the SeaGate Centre,” slicing and dicing his way through lapped traffic for a convincing victory over Billy Wease and Schrader in the 60-lap midget feature. From his vantage point several car-lengths behind, Schrader could only watch in admiration as his teammate for the weekend deftly showed his skill. Racing indoors, the longtime NASCAR Sprint Cup driver said, isn’t terribly complicated. “It’s easy,” Schrader said with a smile. “All you’re doing is turning left. The 41-year-old Stanbrough has long been regarded as one of the nation’s top non-winged sprint car drivers, as his 15 overall victories in 2008 attest. But now, racing indoors on concrete instead of outdoors on dirt, he’s won twice in three starts for Rick Daugherty’s Peterbilt of Northwest Ohio team. A lack of patience -- and a broken radius rod -- doomed Lou Cicconi Jr., who has qualified no worse than second in the three Rumble Series races but has yet to finish better than 10th. Glued to Stanbrough’s tail through the first 43 laps, Cicconi tried to pass high and low but eventually spun in turn two while trying the outside groove. Stanbrough pulled away from Wease and Schrader, with Tony Elliott and Matt Westfall completing the top five in the 14-car field. Wease, the winner here on Friday, gave car owner Randy Burrow the series point lead but, like Schrader, had nothing for Stanbrough. John Ivy bagged the 40-lap winged outlaw modified midget after Charlie Schultz, the winner on Friday, exited with an engine problem. 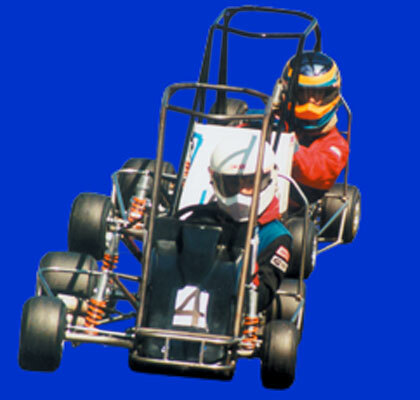 Brian Sebetto, Devon Dobie, Damen Bock and Dalton Adkins won in karts, while Bryce Dickson, Austin Nemire, Nick Ley and Cooper Clouse took home quarter midget victories. The Rumble Series wraps up its season Dec. 26-27 with the 11th annual “Rumble in Fort Wayne,” where Tony Stewart will compete both nights with the midgets. Stewart and Wease are the defending champions at the Memorial Coliseum Expo Center. Schrader, 53, sounded like he’s open to an invitation again next season. “It’s fun, man,” he said. “It’s good racing. You’re limited with what you can do (as a driver) in December. The Rumble Series does a great job. As he found out on Saturday, some of those middle-aged guys aren’t too bad to watch, either. Feature (20 laps) -- 1. Bryce Dickson; 2. Justen Garmenn; 3. Jonathon Lesiecki; 4. Shelby Campbell; 5. Boomer Logan; 6. Nate Steele; 7. Austin Kendall. Heat, round two (8 laps) -- Clouse, Nemire, Blakely, K. Feeney, Streicher, Rankine, R.. Feeney, Price, McCune. Feature (20 laps) -- 1. Austin Nemire; 2. Ross Rankine; 3. Cooper Clouse; 4. Kyle Feeney; 5. Andrew Blakely; 6. Mox Price; 7. Riley Feeney; 8. Richie Streicher; 9. Anthony McCune. Feature (20 laps) -- 1. Nick Ley; 2. Nate Steele; 3. Jonathon Lesiecki; 4. Shelby Campbell; 5. Austin Kendall. Feature (20 laps) -- 1. Cooper Clouse; 2. Ross Rankine; 3. Mox Price; 4. Austin Nemire; 5. Andrew Blakely; 6. Kagen Schroyer; 7. Jonathon Lesiecki; 8. Bryce Nichols; 9. Kaden Harper; 10. Tyler Garner. Qualifications -- 1. Billy Wease, 99, Burrow, 7.409 seconds; 2. Lou Cicconi Jr., 75, 7.427; 3. Jon Stanbrough, 14, RAD, 7.521; 4. Ken Schrader, 14, RAD, 7.604; 5. Matt Westfall, 19, Ryder, 7.710; 6. Joe Liguori, 28, Cottongim, 7.756; 7, Mike Osite, 20, Osite, 7.765; 8, Geoff Kaiser, 10, Moore, 7.771; 9. Tim Jedrzejek, 8up, Williams, 7.846; 10. Tony Elliott, 5, Williams; 11. Brandon Knupp, 15k, Knupp, 7.896; 12. Charlie Schultz, 56, Rencurrel, 7.901; 13. Ryan Klingelhofer, 08up, 7.927; 14. Kim Hughes, 53, Johncox, 7.932; 15. Travis Young, 28s, Cottongim, 7.958; 16. Tyler Nuckles, 00, Miller, 7.976; 17. Kyle Hamilton, 33, Hamilton, 8.001; 18. David Fuhrman, 32x, Fuhrman, 8.061; 19. Cap Henry, 04, TCH-Henry, 8.401; 20. Jim “Timex” Morgan, 2, Morgan, NT; 21. Moe Lilje, 56x, Rencurrel, NT. First heat (8 laps) -- Wease, Jedrzejek, Westfall, Hamilton, Klingelhofer, Lilje. Second heat (8 laps) -- Elliott, Cicconi, Liguori, Fuhrman, Hughes. Third heat (8 laps) -- Knupp, Stanbrough, Henry, Young, Osite. Fourth heat (8 laps) -- Schultz, Kaiser, Schrader, Nuckles, Morgan. First semi-feature (8 laps) -- Osite, Hughes, Lilje, Fuhrman. Second semi-feature (8 laps) -- Hamilton, Klingelhofer, Young, Morgan. Feature (60 laps) -- 1. Jon Stanbrough; 2. Billy Wease; 3. Ken Schrader; 4.Tony Elliott; 5. Matt Westfall; 6. Tim Jedrzejek; 7. Charlie Schultz; 8. Joe Liguori; 9. Kyle Hamilton; 10. Lou Cicconi Jr.; 11. Geoff Kaiser; 12. Brandon Knupp; 13. Cap Henry; 14. Mike Osite. Lap leaders: Stanbrough 1-60. Qualifications -- 1. Mike Iles, 711, 7.470 seconds; 2. Charlie Schultz, 75, 7.527; 3. Billy Murphy, 84b, 7.540; 4. John Ivy, 02, 7.558; 5. Erick Rudolph, 72, 7.615; 6. Cap Henry, 04, 7.708; 7. David Williams, 3, 7.716; 8. Matt Janisch, 14x, 7.834; 9. Jim “Timex” Morgan, 7.846; 10. Danny Shirey, 16, 7.898; 11. Amanda Quinones, 00, 8.028; 12. Larry Fox, 28, 8.156; 13. Matt Roselli, 66, 8.196; 14. Junior Gould, 65, 8.220; 15. Jason Ormsby, 51, 8.229; 16. Scott Fasse, 26m, 8.277; 17. Mark Zumbrun, 35z, 8.356; 18. Richard Smith, 12, 8.367; 19. Rusty Strausbaugh, 29, 8.382; 20. A.J. Lesiecki, 14, 8.433; 21. Dan Dunigan, 19, 8.531; 22. Timmy Neal, 22, 8.565; 23. Aaron Moloney, 4, 8.614; 24. Paul Price, 61, 8.726; 25. Ed Wilberg Sr., 55, NT; 26. Ryan Nawrocki, 5, NT; 27. Larry Joe Sroufe, 21, NT. First heat (8 laps) -- Iles, Ivy, Shirey, Williams, Neal, Strausbaugh. Second heat (8 laps) -- Schultz, Janisch, Rudolph, Quinones, Zumbrun, Lesiecki, Gould, Moloney, Nawrocki. Third heat (8 laps) -- Morgan, Henry, Smith, Ormsby, Dunigan, Price, Fox, Murphy. First semi-feature (8 laps) -- Roselli, Fasse, Murphy, Strausbaugh, Dunigan. Second semi-feature (8 laps) -- Gould, Lesiecki, Neal, Price, Zumbrun. Feature (40 laps) -- 1. John Ivy; 2. David Williams; 3. Jim “Timex” Morgan; 4. Matt Janisch; 5. Matt Roselli; 6. Richard Smith; 7. Danny Shirey; 8. Jason Ormsby; 9. Amanda Quinones; 10. Cap Henry; 11. Charlie Schultz; 12. Mike Iles; 13. Erick Rudolph; 14. Mark Zumbrun; 15. Junior Gould; 16. Larry Fox. Feature (20 laps) -- 1. Brian Sebetto; 2. Nick Bowers; 3. Ryan Moran; 4. Tim Smith; 5. Heath Phillips; 6. Ali Kern; 7. Nathan Gressman; 8. Jeremy Campbell; 9. Brook Wilson; 10. Dustin Trost; 11. John Ivy; Jason Congdon. Feature (20 laps) -- 1. Devon Dobie; 2. Kyle Beck; 3. Cameron Deckard; 4. Austin Allison; 5. Kory Crabtree; 6. Austin Long; 7. Joshua Davis; 8. Kyle DeKnight; 9. Dylan Hoffbauer; 10. Kyle Horn. Feature (20 laps) -- 1. Damen Bock; 2. Brandon Schnittke; 3. Craig Strayer; 4. Sam Longanbach; 5. Mike Markle; 6. Breanne Deckard; 7. Rick Dukes; 8. Erik Wolleson; 9. Joe Warner; 10. D.J. Foos; 11. Cody Prosser. Feature (10 laps) -- 1. Dalton Adkins; 2. Ty Canoles; 3. Brittany Kingseed; 4. Larry Kingseed. Heat, round one (8 laps) -- Bryce Dickson, Justen Garmenn, Nate Steele, Shelby Campbell, Jonathon Lesiecki, Austin Kendall. Heat, round two (8 laps) -- Garmenn, Dickson, Campbell, Steele, Lesiecki, Boomer Logan, Kendall. Feature (20 laps) -- 1. Bryce Dickson; 2. Justen Garmenn; 3. Shelby Campbell; 4. Nate Steele; 5. Boomer Logan; 6. Jonathon Lesiecki; 7. Austin Kendall. Heat, round one (8 laps) -- Ross Rankine, Andrew Blakely, Cooper Clouse, Anthony McCune, Austin Nemire, Riley Feeney, Kyle Feeney, Kagen Schroyer, Mox Price, Richie Streicher. Heat, round two (8 laps) -- Rankine, Blakely, Price, K. Feeney, Nemire, Schroyer, R. Feeney, Clouse, McCune, Streicher. Feature (20 laps) -- 1. Andrew Blakely; 2. Ross Rankine; 3. Cooper Clouse; 4. Austin Nemire; 5. Kyle Feeney; 6. Mox Price; 7, Anthony McCune; 8. Riley Feeney; 9. Kagen Schroyer; 10. Richie Streicher. Heat, round one (8 laps) -- Isaac Chapple, Shelby Campbell, Nick Ley, Jonathon Lesiecki, Nate Steele, Austin Kendall. Heat, round two (8 laps) -- Campbell, Ley, Chapple, Steele, Kendall, Lesiecki. Feature (20 laps) -- 1. Nick Ley; 2. Shelby Campbell; 3. Nate Steele; 4. Jonathon Lesiecki; 5. Austin Kendall; 6. Isaac Chapple. Heat, round one (8 laps) -- Andrew Blakely, Cooper Clouse, Ross Rankine, Kagen Schroyer, Mox Price, Tyler Garner, Bryce Nichols, Austin Nemire, Kaden Harper. Heat, round two (8 laps) -- Rankine, Nemire, Clouse, Blakely, Garner, Schroyer, Harper, Nichols, Price. Feature (20 laps) -- 1. Andrew Blakely; 2. Ross Rankine; 3. Mox Price; 4. Cooper Clouse; 5. Jonathon Lesiecki; 6. Austin Nemire; 7. Kaden Harper; 8. Tyler Garner; 9. Kagen Schroyer; 10. Bryce Nichols; 11. Austin Kendall; 12. Isaac Chapple; 13. Nate Steele; 14. Nick Ley.